Rachid Bouchareb was recently the centre of much attention at the Cannes film festival due to his controversial film "Hors la Loi" (Outside the Law). 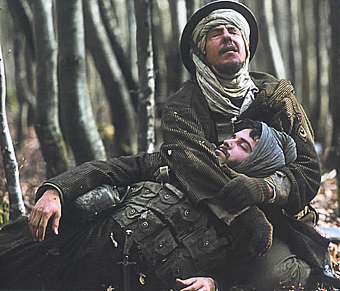 Most of the criticism came from the "French Algerians" who took exception to the content of the film and its portrayal of the Algerian war of independence. Perhaps it was in order to avoid such controversy that his earlier film was given the ridiculous title of Days of Glory, rather than Indigenes, which means the farmers or natives in the French language. In Arabic the title of the film was given as البلديون which might mean the country boys but I think I am missing a local Algerian nuance in assuming that. Still, the title was not what irked me, but rather the synopsis of the film, which seemed to indicate that the film was about the brave heroism of Algerians who wanted to defend their "Fatherland", France, from occupation. Upon watching the film, one quickly realises that the film hints subtly at the irony, and lunacy, of mostly Berber men being enlisted at the start of the film to save France. It seemed an accurate portrayal of some of the naivety that was perhaps present amongst many of these young men who were sent to their deaths in the killing fields of Europe. Later, however, we notice that all is not well on the liberty, fraternite and egalite front. Black soldiers are not allowed tomatoes like their French counterparts in the mess, African soldiers were not given the same luxuries that white soldiers were given, and ultimately, the sacrifice of these Algerian men in the war was never acknowledged. The film might have been portrayed in France as highlighting the plight of these men and their bravery in helping to liberate that country, but I think any Arab or Muslim watching this film will feel something quite different. There is a distinct realisation that it was not only our countries that were exploited, but the souls of generations of fine young men and women were crushed and expended. We were cannon fodder then and we are so now, cheered on by the occupier's jingoism. Following the end of the Second World War, the French committed the worst massacres in Algeria to keep it decisively as a province of France. These massacres were the catalyst for Algeria's war of independence, a war that would earn the country the sad title of بلد المليون شهيد (The country of a million martyrs). It will take more than creative repackaging of a DVD to hide this true nature of the relationship between the two countries. Somehow, the theme that the ideals of a French revolution betrayed Algerian Muslims who "were good enough to be French" is a tired one, and unconvincing. The film, however, is excellent and I strongly recommend it. Some of the scenes were heart-wrenching and the characters were people you could really connect with. Massaoud, one of the characters, and his relationship with Irene, a French woman, brought a touch of sadness and romance into this film, and another human perspective. I look forward to watching Hors la Loi when it is released.